Summer savory (Satureja hortensis) is among the best known of the savory genus. It is an annual, but otherwise is similar in use and flavor to the perennial winter savory. It is used more often than winter savory, which has a slightly more bitter flavor. 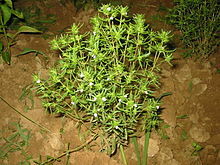 It grows to around 30 to 60 cm (0.98 to 1.97 ft) in height and has very slender, bronze-green leaves. Summer savory is a traditional popular herb in Atlantic Canada, where it is used in the same way sage is elsewhere. It is the main flavoring in dressing for many fowl, mixed with ground pork and other basic ingredients to create a thick meat dressing known as cretonnade (cretonade) which may be eaten with turkey, goose and duck. It also is used to make stews such as fricot, and in meat pies. It is usually available year-round in local grocery stores in dried form and is used in varying proportions, sometimes added to recipes in large generous heaping spoonfuls (such as in cretonnade), and sometimes more subtly (as in beans, for which savory has a natural affinity). Summer savory is a characteristic ingredient of herbes de Provence. It is also widely used as a seasoning for grilled meats and barbecues, as well as in stews and sauces. Summer savory is preferred over winter savory for use in sausages because of its sweeter, more delicate aroma. It plays an important role in Bulgarian cuisine, providing a strong flavor to a variety of dishes. Instead of salt and pepper, a Bulgarian table will have three condiments: salt, red sweet pepper,and summer savory. When these are mixed it is called sharena sol (шарена сол ‘colorful salt’). Summer savory is used in Romanian cuisine, especially in sarmale (stuffed cabbage or grape leaf rolls). чубар (čubar) in Serbian, and чабер (chaber) in Ukrainian. Summer savory is raised from seed grown in a rich, light soil. The seeds are very slow in germinating. The early spring seedlings are often topped for fresh use in June. When the plants are in flower, they may be pulled up and dried for winter use. Brown, O. Phelps. Complete Herbalist. 1. New Delhi, India: Logos Press. p. 150. ISBN 81-7268-190-9. Cutler, Karan Davis & Kathleen Fisher, Suzanne DeJohn (2010). Herb Gardening For Dummies. National Gardening Association. pp. 328, 329. ISBN 978-0-470-88746-2. King, John & Robert S. Newton (1852). The eclectic dispensatory of the United States of America (Google eBook). Cincinnati, Ohio: H. W. Derby & Co. p. 369.